The commemorative pavilion is a “healing tool for the resolution of loss.” It will provide a menu of mourning options provided by the interior configuration and the openness to nature and light. Upon approach of the commemorative pavilion a framed view of the forest is the primary image with a table of memory centered on the opening. To the right side is a bench for seating for 4 warriors. Above the bench is a wall of memory that is flexible in nature allowing for veterans to continuously populate the interior wall with photographs, maps, or poetry verse, thoughts, or quotes that help a warrior cope with a multitude of losses. The Army warrior in the workshop expressed his interest in seeing a map of where he was. There are two additional seats on the left side for a seating capacity of 6 warriors (not including wheelchairs). On the left side as a warrior enters are 12 memory boxes. The “memory boxes” allow for warriors to bring special objects they carried to war or received from home or even the Green Road’s natural elements. The other warrior in the workshop expressed his desire for the soil of the foreign land on to be placed within the commemorative space. A small shelf adjacent to two fixed seats allow for the warriors to journal, write letters, or compose poetry as expressions and tools to resolve their losses. In addition, the pavilion for the playing of music. Achilles played the harp as he mourned his fallen brethren at Troy. 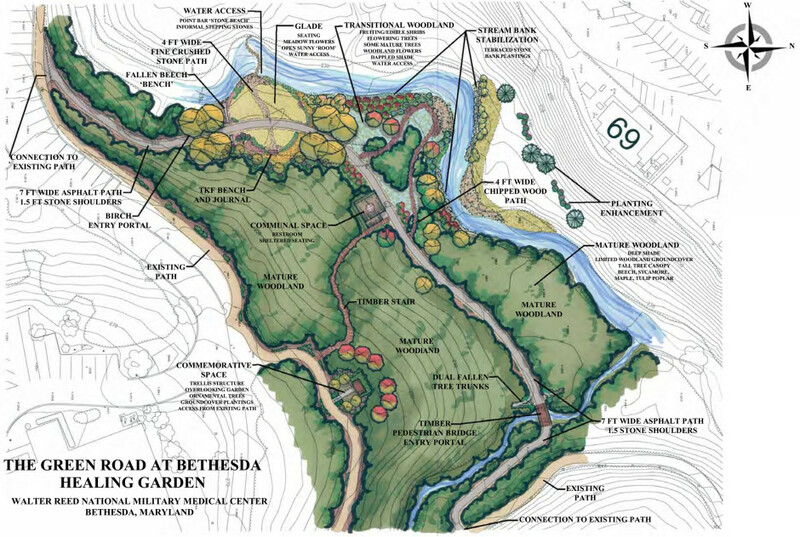 The Commemorative Pavilion allows for veterans to flow through the stages of mourning by utilizing nature; the woods, the water, the stream bed, the pathway, and additional gardens. 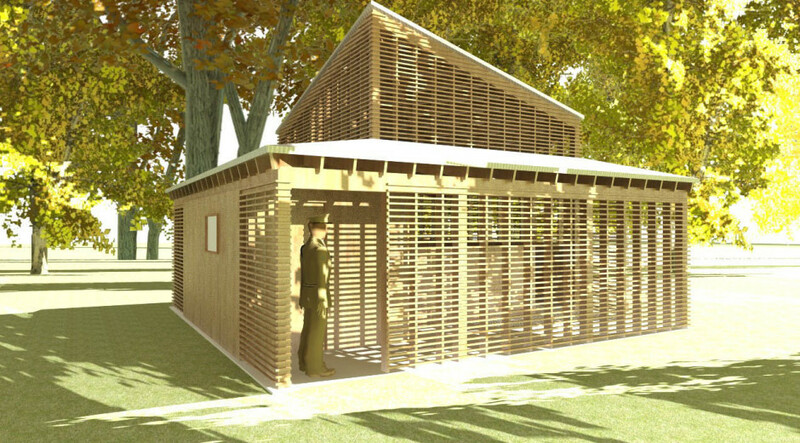 The Communal Pavilion and the Commemorative Pavilion will be used as transitional objects by the veteran on a personal journey towards their resolution of loss. As seen by Warriors who have left the service who have not resolved their losses, this often leads to a journey of alcohol abuse, drug abuse, violence and even suicide. When a warrior returns from combat duty one of the first acts of processing is telling stories of events that were experienced and witnessed. The people they are most comfortable sharing this with are fellow warriors. 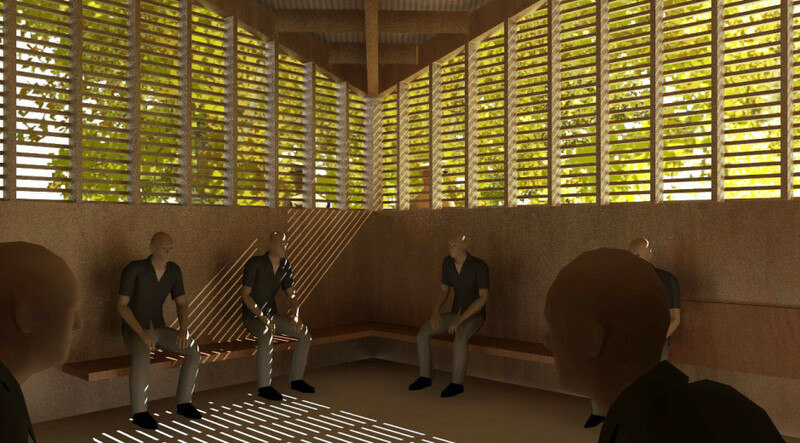 The proposed communal pavilion allows up to 8 warriors share their wartime experiences and begin the process of healing. For when you begin to feel you begin to heal. Attached to the communal area is a corridor attached to an ADA bathroom. The corridor allows for up to two warriors waiting for the bathroom without interfering with any discussions in the communal spaces. The form of the communal space is generated by the prevailing breezes, sunlight, and the focusing of views towards the stream and surrounding nature. The angled roof blocks out the majority of the buildings on the opposite stream bank that are on top of the ridge. The focus on the natural environment, animal life, and water, gives the warrior as an opportunity to de-stress.